There are a lot of instructions on this page- please read all the way through! Again…make sure to click on the FREE option! Pick a theme you like. You can always change this later! 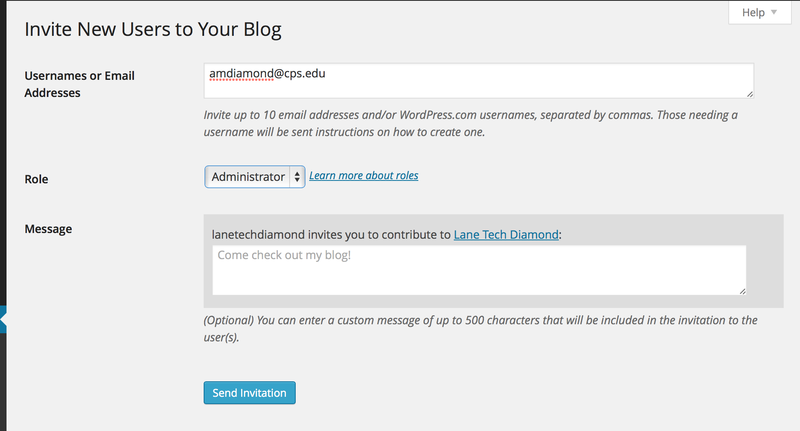 The dashboard in WordPress is the place where you can make a lot of your changes to your blog. In order to get to your dashboard, type the name of your url and then /wp-admin. For example, I would type in http://photographyelephantssunflowersellen.wordpress.com/wp-admin to get to the dashboard on my site. Make sure your About, Portfolio, and Class Projects pages are visible. If you have a ‘Contact’ page, you can delete it. If your pages are not showing, it is because you have not confirmed your email OR it is because of the theme. If you know you have confirmed your email, then you will need to add a widget.